DarntonB3 provided architectural services to Wiltshire Council under a framework agreement, being responsible for the design and construction of successful projects across a variety of public sector uses, including leisure, residential, support services and more. The firm was appointed to create a brief for the design of new houses for elderly people, subsequently being commissioned to prepare designs for housing on 4 sites in Wiltshire. The purpose of the initiative was to create affordable and accessible housing for elderly people in rural areas to allow them to stay within their own communities, rather than move to larger extra care developments some distance from their original homes. Initial feasibility studies ruled out one site, however 12 houses on 3 sites at Rowde, Durrington and East Knoyle were taken through to completion in 2017 and 2018. The single storey 2 bedroom houses are designed to ‘Lifetime Homes’ standards with in-built flexibility allowing changes to be made as needs arise, such as the inclusion of hoists. Level thresholds, wider doorways and additional kitchen space are also included. 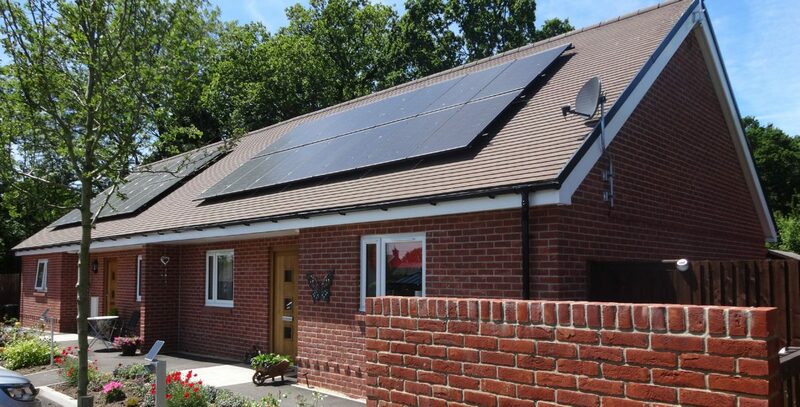 The houses are designed to high environmental standards incorporating features such as Photvoltaic roof panels and air source heat pumps. The nature of the sites posed several challenges such as poor drainage, lack of services and ecological issues, all of which were overcome, allowing the creation of valuable new homes for elderly people.